Quite A Milestone…or is that A Quiet Milestone? There is much surprise and delight here at Gidday HQ today! You see, I’ve been away for a few days at a conference (more about my travels later) and have not had the time or the internet access to lavish my usual attention on these virtual ramblings. But it seems that in my absence, you’ve been rather busy in the ‘lavish-ing’ department over the last couple of days. 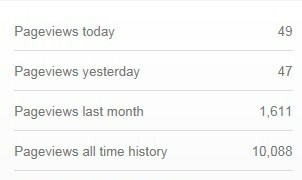 I opened my dashboard today to see that Gidday from the UK had tiptoed quietly past the quite significant milestone of 10,000 page views to reach 10,088 page views. That represents all of those times you dropped in to say ‘Gidday’. Amazing! Wicked! Bonza! I feel honoured and completely chuffed. Who would have thought it eh? Thanks so much for your support/visits/comments and hope you continue to enjoy fossicking around for the next 10,000. This entry was posted in blogging, Gidday Firsts and tagged blog stats by Kym Hamer. Bookmark the permalink. Thanks Charlie, and yes, fossick is a GREAT word. There was many a raised eyebrow when I first turned up in London and told people I'd been for a fossick on their desk! I've never come across Fossick before, what a great little word. Congrats on 10,000, hope you get many more. I've had a splendid time fossicking around on your site. Congrats on this milestone, and may you have many more!! !